C’est la Vie is owned and operated by the remarkable Olivier and Deb Megret, barge industry veterans since 1985 and 1986, respectively. Their reservoir of talent is apparent upon boarding the C’est la Vie, as every detail has been thoughtfully addressed. Hailing from a family who has been active in the industry since its inception, Olivier has an outstanding barging pedigree, having grown up on the French canals. He offers uniquely intimate insights into the world of barging, and thrives on introducing guests to canal cruising. Deb’s background is equally as impressive, as she honed her hospitality skills on the inland waterways of her native Britain. This dynamic duo met as crew on a barge cruise, and the rest is history. Between them, they boast decades of experience working aboard luxury barges in all positions: Chef, Captain, Tour Guide, and Hostess. Their reservoir of talent is apparent upon boarding the C’est la Vie, as every detail has been thoughtfully addressed. This handsome barge welcomes guests to four of the most spacious and luxuriously-appointed cabins on the canals, a wonderful amenity for those to whom personal space is paramount. While relaxing on the expansive teak deck, guests are pampered by the attentive crew, perhaps while savoring a glass of wine from Oliver’s well-stocked cellar. Active pursuits such as bicycling and strolling along the canal’s towpath are the perfect way to explore the region’s natural beauty, or guests can socialize in the window-lined salon and dining room and admire the pastoral scenery as it floats by. Culinary delights reveal the region’s abundance of food and wine; locally-produced vintages, many from the celebrated vineyards of Sancerre, are perfectly paired with seasonally inspired gourmet cuisine. Guided excursions to the area’s attractions and antiquities encourage guests to explore the Upper Loire’s best sights and scenes. In the afternoon, you will be met by a crew member of the C'est la Vie at the designated meeting point. 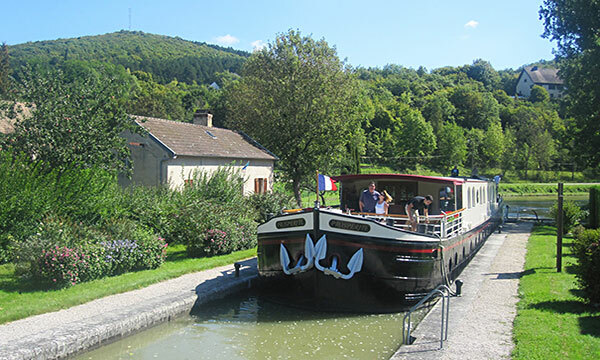 From here, relax as you are chauffeured to the barge, moored in the delightful town of Sancerre. A traditional champagne welcome and introduction to the crew awaits you, before your first of many gourmet dinners onboard. C’est la Vie begins her morning journey by languidly gliding along the canal. Relax on deck or explore the towpath with a gentle pedal or leisurely stroll. This afternoon, your Tour Guide chauffeures you to Sancerre, a Medieval town, that was once a fortress and is perched high over the River Loire’s vineyards. A private wine tasting then introduces local vintages, while revealing the refined world of spirit pairings and flavor profiles. Back onboard, aperitifs and cocktails await, preceding a sumptuous multi-course dinner. This morning, the C’est la Vie crosses the River Loire via the Pont Canal, an aqueduct designed by Gustav Eiffel. Guests can explore the aqueduct by foot alongside the barge, or enjoy the scenery from front row seating on deck. Upon mooring, your Tour Guide escorts you to the 10th century Chateau of St. Fargeau. Having undergone many additions and restorations, the chateau boasts six towers and has an unusual shape of a pentagon. Return to the barge to freshen up before a special dinner ashore at the Michelin starred Auberge des Templiers. Start the day with a visit to the of Gien, famous for its exquisite French tableware and handmade pottery. Your Tour Guide will accompany you to the Gien factory, where artists are perfecting their craft by creating and painting the tableware. Watch them in action, and then shop and stroll your way through this town brimming with authentic French life. After a thorough visit, an afternoon cruise awaits, and you will pass the remains of seven remarkable canal locks dating from the 16th century. Cocktails and dinner served onboard round out the day. During this morning's lazy cruise, relax on deck and admire the bucolic scenery gently drifting by, or explore the towpath by bicycle or on foot. Upon mooring, you Tour Guide will chauffeur you to Chateau de la Bussiere, a romantic 12th century chateau originally built as a fortress. Inside is an extensive collection of art illustrating the theme of fishing, while outside we may encounter the Countess working in her expansive vegetable and flower gardens. Back onboard, enjoy cocktails and canapes before Chef presents tonight's gourmet dinner. 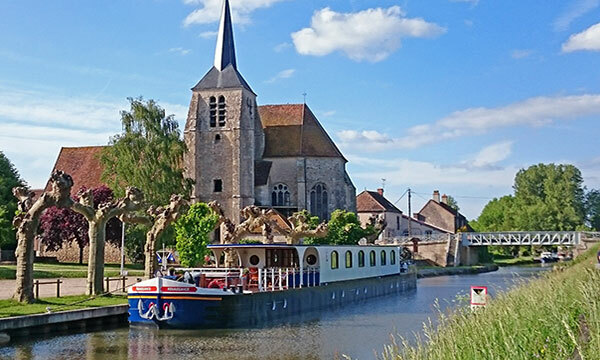 Enjoy one last leisurely bicycle ride or stroll along the towpath while C’est la Vie completes her final journey into the colorful town of Montargis. Characterized by the charming canals which cross the town, Montargis boasts 131 flower laden bridges, explaining why it is affectionately known the "Venice of the Gatinais". Visit a confectionery shop for pralines, which were first created here in the time of Louis XIII. Return to the barge and freshen up before tonight's celebratory Captain’s Dinner, ending your cruise in style.